I didn't pay a red cent for my first Carnegie concert of the season tonight, thanks to the generosity of the Subscribers Office, which handed out free tickets to hear the ACJW Ensemble. 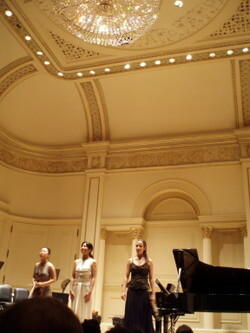 Members of the ACJW - short for "Academy of Carnegie Hall, the Juilliard School, and the Weill Music Institute - receive a two-year fellowship during which they engage in intensive musical training and performance while also teaching in a NYC Public School. Tonight, the young players offered a concert in Weill Recital Hall of works from the 20th and 21st Centuries, starting with Bright Sheng's Chinese-tinged "Four Movements for Piano Trio" and "Sweet May Again" for double-bass and piano, and moving on to works by Poulenc and Bartok. 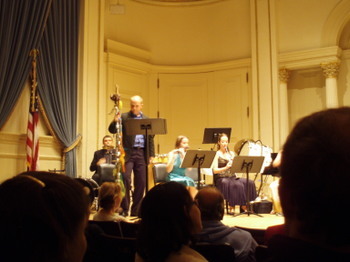 Outstanding players included the Venezuelan pianist Gabriela Martinez, the Montreal-born clarinetist Romie de Guise-Langois, and violinist Angelia Cho. But the best was saved for last. David Bruce's (b. 1970) Piosenki, which received it's world premiere in this same hall just six months ago, is a cycle of Polish folk songs and children's poems written by Julian Tuwim and other anonymous sources. The musicians played like a Polka band gone awry, and were accompanied by the remarkable actor-singers Melissa Wegner and Kyle Ferrill - who doubled up late on a strange rattlestick instrument apparently used in Polish festivals. The amusing, often bawdy songs caused belly laughs throughout the recital hall. 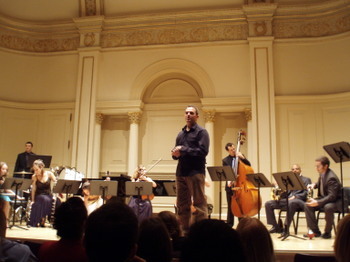 The Ensemble ACJW will be performing at various Carnegie venues throughout the 2007-08 season, with their next perfomance on 10/30, in a concert featuring music by John Cage, Tan Dun and Mozart.